Prizes! Yay! We have won another award or two or three. We were given the One Sweet Blog Award from our friends at Hutch a Good Life and the Super Sweet Blogging Award from our friend Clowie and the whole zoo at Dog Daz. Take a look at them! Cupcakes! Like my name! 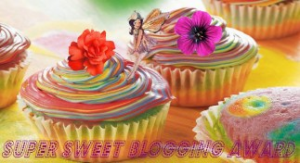 Mom named me Cupcake because I am so sweet and now my blog is also sweet, just like me! After Mom gets to the end of the story, she has to leave it alone for a while. That’s like when the cupcakes have to cool off. When the story cools off for a while, Mom will put frosting on it. Oh no! That’s the cupcakes. She’ll revise the story A LOT. She’ll cut words that slow the story down, add words that move the story along, read it out loud ten million times, do everything she can to make it better, and cover the top with sprinkles. Wait. What? I love sprinkles. And frosting. And cupcakes. And stories! 1. Give credit to the person who chose you. 2. Answer the ‘Super Sweet’ questions below. 3. Nominate a “Baker’s Dozen” (13) blogs. 1. Cookies or Cake? Both. And bacon. And anything from the garbage pail. And goose poop. 2. Chocolate or Vanilla? Chocolate is poison, for dogs, so I’ll say chocolate. I like eating poison every chance I get. 3. What is your favorite sweet treat? Mom’s homemade frozen yogurt dog pops. 4. When do you crave sweet things the most? Every minute of every day. 5. If you had a sweet nickname, what would it be? I already have a sweet name!! Now I will name 13 blogs that I like. If you already have the award, then congratulations. Either way, we picked you because we like you, and want lots of other people to like you along with us. 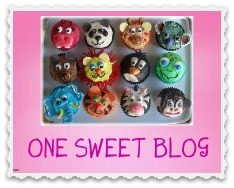 I wish a baker’s dozen was 100, because we really like a LOT of blogs! Oh you do look sweet helping with the cooking! Those sweet awards suit you perfectly, as does your name. Thanks, Clowie! 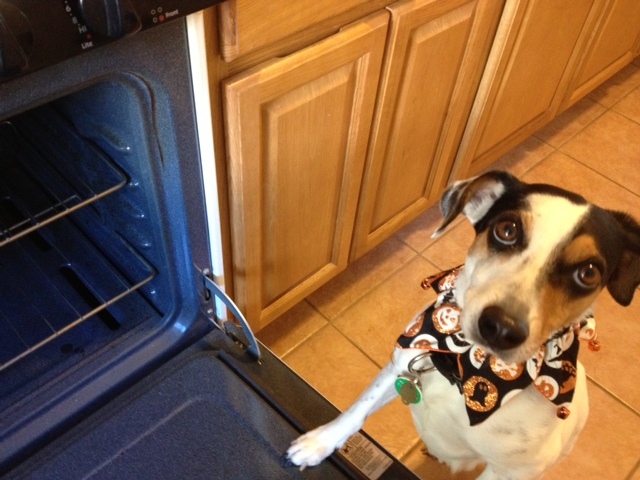 I am a big cooking helper. I hardly get in the way at all…. Thanks, piggies. Sweet is my favorite way to be. Congratulations!!! Enjoy cupcakes and stories and have a super sweet wednesday!!! Thanks, Easy! I wish I could eat a real cupcake! Thanks Mollie and Alfie! Even though Mom writes two at once, it still takes twice as long. Wait. What?? Congratulations cuppycake, you are so cute!! Thanks, Misaki! I like being cute! Thanks, Misaki! KLR Is a fun new blog friend. Now we are following each other. As long as I don’t have to be friends with the c-a-t. We’ll be fine. You are sweeter than cotton candy. Congrats on the award and thanks for passing it on. Thanks, Doggie! Cotton candy!? Yum! You are sweet too! Hi Cutie Cupcake! 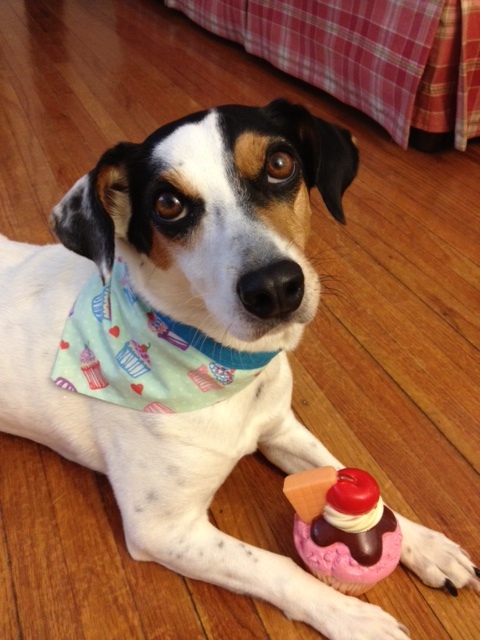 Concatulations on TWO sweet awards – couldn’t happen to a sweeter pup! It’s nice that you help your Mom when she’s baking AND when she’s writing. I try to do the same thing but Mom says I can be somewhat “distracting” – whatever THAT means! Thanks for mentioning ME too!!!! Thanks, Sammy. I never heard of distracting. Is it something like naughty? I hear that A LOT! Hurray for baking cupcakes and baking stories and for you, the sweetest Cupcake of them all! Good luck to your Mom on those two stories at once. All those story ingredients are so important. I should write down the recipe so I remember it. Thanks, Beth. That is an important recipe, but the recipe for the homemade frozen yogurt pops is the most important one around here! Thanks! Hands down, paws down, I would LOVE to be a doggie model. Mom sends pictures and videos to TV shows and contests all the time. So far, I’ve been on one calendar and in one political cartoon book. That’s a start….. Thanks Hamsters. My picture was on the 365 days of dogs calendar on May 10, 2010. Mom’s been trying to get me back on since then. Of course I’m a diva!!! You are so talented & perceptive! Writing is like baking – you need to add just the right ingredients, stir & stir, then let it simmer until you get everything “just right”. 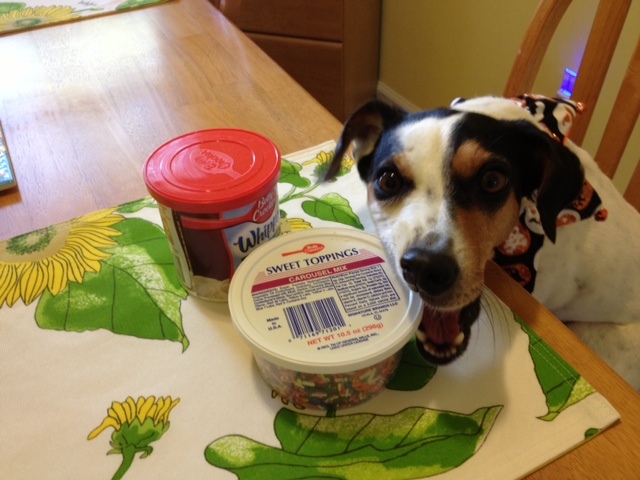 Thanks for sharing Mom’s recipe – think I need to try it! Goose poop? Oh, Cupcake! The Two Orange Pups are partial to bunny droppings….Less messy! Thanks, Patricia. Those orange pups are naughty like me, eating all that evil stuff. Mom says I’ll get a spankin’. I think that’s something like bacon! Yay! You ARE the sweetest so these awards are so ‘you’. I’m with you on the bacon. It belongs on almost everything! Thanks, Susanna! Of course your blog has all the foods I love, and all the stories Mom loves. Sometimes she can’t comment because your blog hates her and fights with her. Thanks, Donna. Sweet is always the look I’m going for. Thanks BR2B. Cakes are yummy. It sounds funny to hear SUMMER. Mom is getting all my sweaters and coats ready around here!! HAHAHAHA! I LOVE your answers Cupcake! I was literally laughing out loud! Great post! Thanks, Erik. I’m happy I gave you a laugh today. Did your tongue hang out and drip a little? That’s what happens when I laugh! Wow! I’m so excited! Another dog in the blog world! I have just found your home thru a round about web way. But I’m glad I did. I think I’ll come visit often. Your place looks pretty fun! Yay, Rhythm! I love new friends! We are a lot alike because we both have jobs at the library. I am like your evil twin! Well, how cool is that! I don’t know any other library dogs! Thanks, AW! Sweet is yummy. Congratulations! We hope you enjoy your sweet award!